Students completed one L2L lesson during daily reading rotations. Kids used L2L independently while Mrs. Hardy taught small groups using the school’s core curriculum. Through 4 months, all students increased their ORF (Oral Reading Fluency), an average of 28.5 WPM (words per minute). 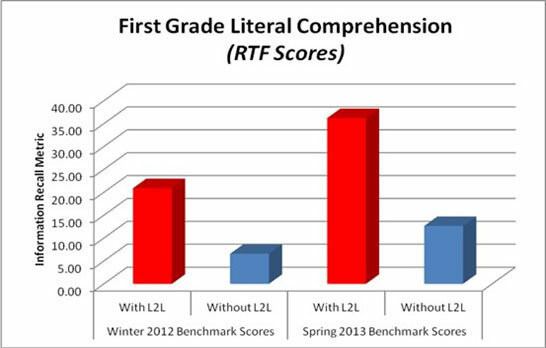 Through 4 months, students using L2L increased comprehension scores by 20 points, 3X more than those who did not use L2L (+6 points). A full year of supplemental fluency videos for every grade level, kinder-5th grade. Multi-Sensory fluency practice: Students, listen, track and read along chorally with rappers and rockers. Reading to rhythm and rhyme commit information, sight words and vocabulary to memory much faster than any other strategy. In one week, students read a story nine times. Because of the music, they love it! All leveled comprehension activities are also available in PDF format. Lexile leveled cold reads and quizzes available for each grade level . Students and educators receive immediate feedback after each leveled quiz. Online data folders for easy grades and leveled achievement snapshots. At the beginning of each quiz, Lefty gives kids test-taking tips, comprehension strategies and encouragement to check the text and do their best. Students are instructed to cross out answers they know are unreasonable, encouraging thoughtful question taking. Every open text constructed response question includes a rubric. Students grade themselves based on their answer ensuring knowledge of expectations.